Today I joined my son to watch his "Catch of the Week" presentation at school. He shyly pointed to his big fish poster filled with baby pictures and favorite things lists, then blushed and whispered "thank you" through a compliment circle as all his classmates took turns saying something nice about him. His smile at the end was radiant. Then I rushed home to get back to working on my Extravaganza projects. Right now I can hear the little boys downstairs giggling with the babysitter. In Oklahoma, the funerals are beginning. As Rachel from Finding Joy wrote, it's a Mile of Perspective for sure. Her essays always touch my heart. This time I was in tears before I even read her words. I bought her book. It's amazing. CTMH is making this stamp set from the upcoming Autumn/Winter 2013 Idea Book available for early purchase. 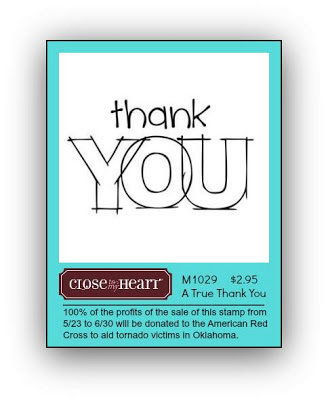 One hundred percent of profits from sales of this stamp set from May 23 to June 30 will be donated to the American Red Cross to aid tornado victims in Oklahoma. It's $3. I'm going to buy a bunch to bundle with 2x2 blocks to have on hand for teacher gifts and friendly thank yous for the many wonderful folks who touch our lives.It's one small thing I can do. I opened a party for OK Relief orders on my website. My full commission from those orders will be donated to the Red Cross efforts as the orders come in. It's another small thing I can do. Stay safe. Hug your littles (and your bigs). Be grateful. Enjoy life.